Student Chapter of University of Moratuwa and ACM holds this special ‘Distinguished Speaker program”. A Guest Lecture by Professor Abhik Roychaudhury is expected on ‘Software debugging as a Science’. Checkout our event page for more details. That’s it folks. thanks for tuning in. This is digit team, signing off. Himeshi De Silva – Chairperson of the ACM Student Chapter of UoM will now announce the upcoming board for ACM Student Chapter of UoM. Dr. Chandana Gamage will hand over the token of appreciation to Professor Abhhik. If a code is missing, how can you debug a software? Abhik asks and the crowd seems to be cluless. Abhik now displays 2 identical pictures with minor differences and says this is the same scenario with program versions. Professor Abhik also shares a few names about evolving programs which are used to develop and debug software’s. 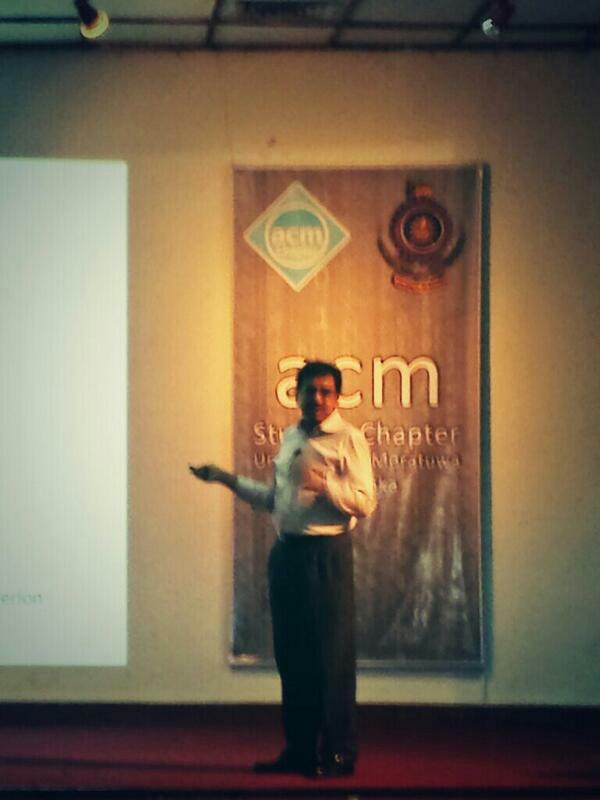 Professor Abhik on stage explains theoretical methods of debugging. so, what does jSlice does? it hepls programmers to find software error-causes. automated debugging and program compression. There are 2 main methods of debugging in which can be applicable still now. Debugging in a economic aspect is as valuable as it is in a personal aspect. visual studio 6, are some of the apps which you can lean on to debug. Abhik explains the difference between software debugging and bug hunting. Professor Abhik shows some Software Design Flow diagrams which at times can be helpful to programmers to abstract code and then debug software. Professor Abhik is about to talk of ‘Software debugging as a Science’. Prof. Abhik says apart from giving this speech today here, he is delighted to be here because they have been working with UoM for a long time and to be here being able to talk to the students and lecturers, is a wonderful experience for him. Compere, introduces the Distinguished Speaker for today. None other than Professor Abhik Roychaudhury. Dr. Chandana Gamage will deliver the Welcome speech. He says Prof. Abhik is not a new guest to UoM. They have been working with them for a long time. Chandana Gamage also thanks ACM Student Chapter for initiating and having such an activity. Professor Abhik Roychaudhury is the Vice-Dean of School of Computing – National School of Computing. Professor Abhik – today’s Distinguished speaker and the rest of the dignitaries will light the traditional oil lamp now. This is the initiation of ACM Student Chapter of University of Moratuwa. Dignitaries are arriving. The event is about to commence in a while. Stay tuned with us and keep an eye on this space for more info as the event proceeds. Today we will be bringing you Live updates from Distinguished Speaker program organized by ACM Students Chapter of University of Moratuwa. Good Morning everyone. digit team here, wishing you a good day.